The very first beer I picked up while in la belle ville de Québec yesterday was, get this, yes, a Unibroue beer! Actually, in fact, this beer is already available in Manitoba as of last week, but of course I didn't know that until Mark told me. Unibroue's Seigneuriale is a Belgian Strong Pale Ale, so a similar style as their incredibly popular La Fin du Monde, but 1.5% less alcohol by volume, but still - it will get you a bit tipsy. Appearance: For A Belgian Strong Pale Ale, it looks quite a bit different than a Fin du Monde, it has a hazy orange with a bit of a brown hue to it, a thin yet white head at top. Aroma: Like 95% of Unibroue's beers, it has the very noticeable and famous Unibroue yeast aroma to it, which to some, can be bored of it by now, but it makes me smirk, consistency is key! A bit of a fruity aroma, a bit of apple and pear to it. 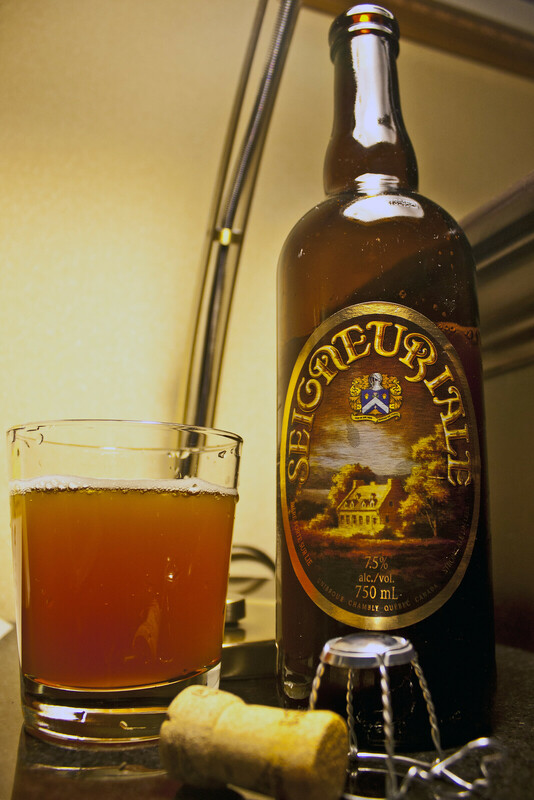 Taste: The typical Unibroue yeastiness mixed with a great fruity sweetness to it. It's a heavier Pale than La Fin du Monde by far, yet still has the citrus zest you come to know and love from La Fin du Monde, a bit of apple zest to it as well - better than the apple in the éphémère pomme (but nowhere near as much apple, of course). Overall Thoughts: A decent Strong Belgian Pale Ale, heavier than their other Belgian Pale, La Fin du Monde, yet it has only 7.5% ABV. A nice fruity & citrus zest. Has the typical Unibroue taste due to the use of the familiar Unibroue yeast, but it's quite a nice beer after a long snowy night. Costs $6 for a 750mL bottle.